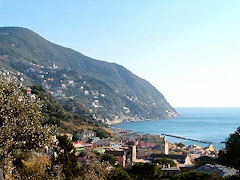 Moneglia is situated in the north-west of Italy just between Genoa and the Cinque Terre. This Ligurian gem lies in a beautiful bay enclosed by two headlands: Punta Moneglia and Punta Rospo. 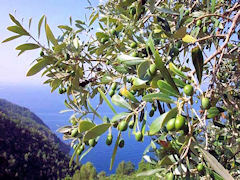 The hills surrounding the town are rich in vegetation and full of olive groves and lemon trees. The beautiful sandy beach with crystal water is about 1 km long and it is protected from the waves by some rocks about 100 mt from the shore. The town has a good selection of shops, cafes and restaurants. The town can accommodate its visitors in hotels and bed and breakfasts in various categories. • Church of Santa Croce, first established in 1130 and rebuilt in 1725. Its courtyard features a wonderful display of colorful stones and inside you will find paintings by the celebrated local artist Luca Cambiaso. Don't miss the church's beautiful Byzantine cross. • Church of San Giorgio, built 1396, with a wealth of important paintings by Cambiaso. Its original Gothic details were reconstructed in the early 18th century. The church includes a Franciscan cloister which was added in 1484. • Castle of Monleone was constructed in the 12th century to help defend Moneglia from pirate raids, the remains of this medieval castle can be visited. • The historic town center with wonderfully preserved medieval houses. Narrow streets are lined with quaint shops and picturesque homes. Have a taste of the delicious Ligurian cuisine at one of the town's fabulous restaurants. • The Olive Oil Fair. A variety of focaccia and olive oil can be tasted at this annual event which occurs on Easter Monday.